These tasty bars are easy to make, while being easy on the wallet. 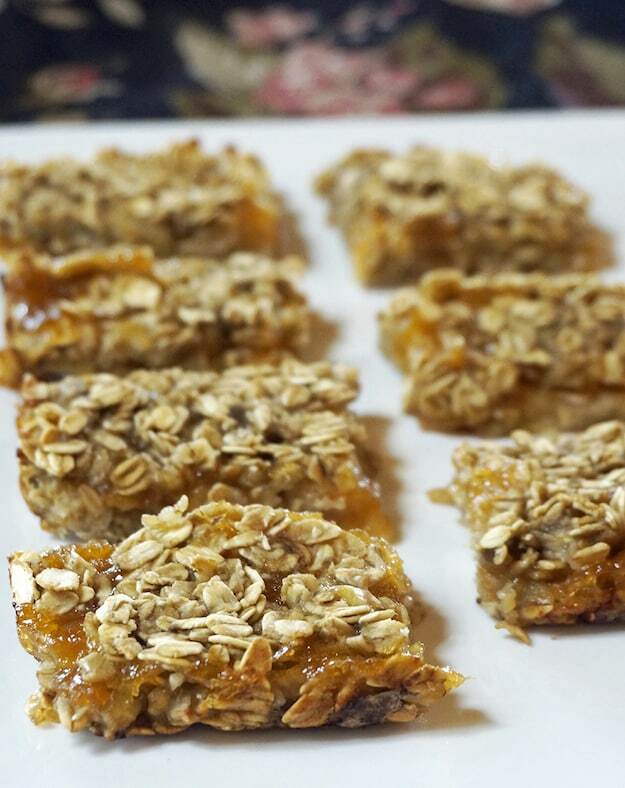 The sweetness comes from the apricot preserves, and rolled oats provide the crunch. Mashed bananas stand in beautifully for egg, and the vanilla extract really jazzes it up! Recipe by Laura Theodore, from JazzyVegetarian’s Deliciously Vegan. Published by Scribe Publishing, ©2018, reprinted by permission. To make the dough, put the bananas and the vanilla extract into a large bowl and mash into a chunky purée, using a potato masher or large fork. Add the oats and stir with a large spoon to thoroughly combine. Press half of the dough mixture into the prepared pan in an even layer. Spread the apricot preserves over the dough in an even layer. Top with the remaining dough, patting it down gently into an even layer. Bake for 22 to 25 minutes, or until the edges are golden. Put the pan on a wire rack and let cool 15 minutes. Cut the “cake” into 12 bars, using a serrated knife and wiping the knife clean often. Using the paper “wings,” carefully lift the bars out of the pan and set them on the wire rack. Let the bars cool for 10 to 20 minutes before serving. Wrapped tightly and refrigerated, leftover bars will keep up to 2 days. CHEF’S NOTE: If the preserves you are using are “watery,” drain the excess liquid from the preserves before measuring and using in this recipe. Do this by placing the preserves in a fine-screened sieve set over a bowl. Let drain for 15 minutes. Proceed with recipe as directed. 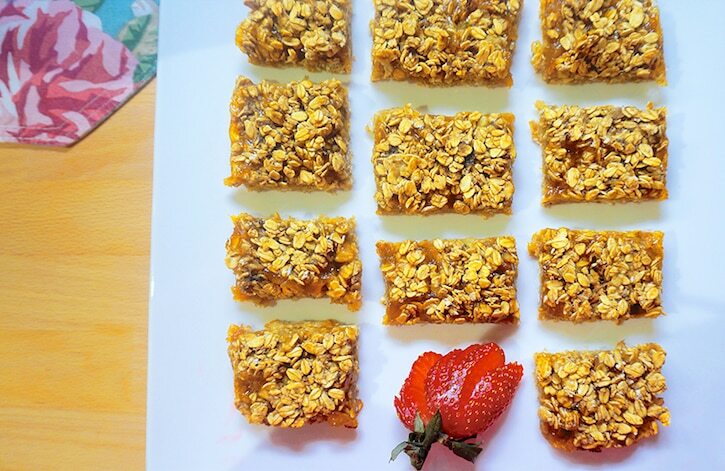 These bars are so easy to make and yet taste lovely. I make them for my father as he is avoiding refined sugar and oil. Even guests who don’t eat this way though have enjoyed these!